It is Manhattan Fish Market 10th Year Anniversary and the launch of 25 New Dishes and I thank Zerika for inviting me in joining her for this fabulous lunch! After 10 years of flexing their mussels in the seafood category and fishing out yummy-licious seafood fares, The Manhattan Fish Market continues to excite diners with an all new menu, new look, new flavours and a wider selection of poached dishes! The new menu offers new starters, pastas, seafood platters and desserts, giving diners a wider sea-lection! Join me as I show you what the awesome team at The Manhattan Fish Market came up with and drool along. I ordered Gummy Bear drink and it tasted as good as the name itself! I believe there was a tinge of pineapple thus the twist of sweet and sour taste. I love this drink for its really thirst quenching and got me contemplating ordering another!! 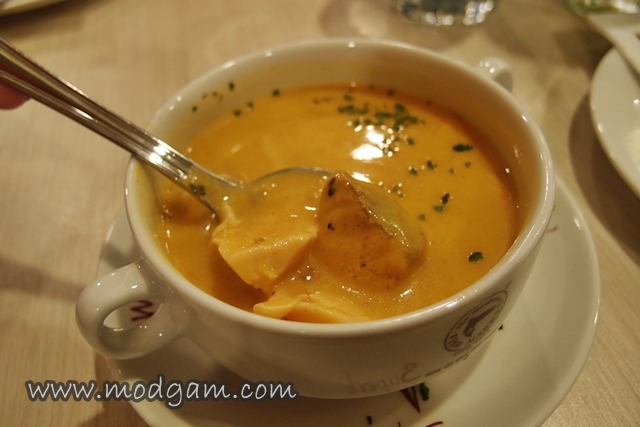 Salmon Chowder S$4.90/Lite, S$5.50/Regular – A creamy offering set to tantalize all salmon fans out there. Check out the huge chunks of salmons! 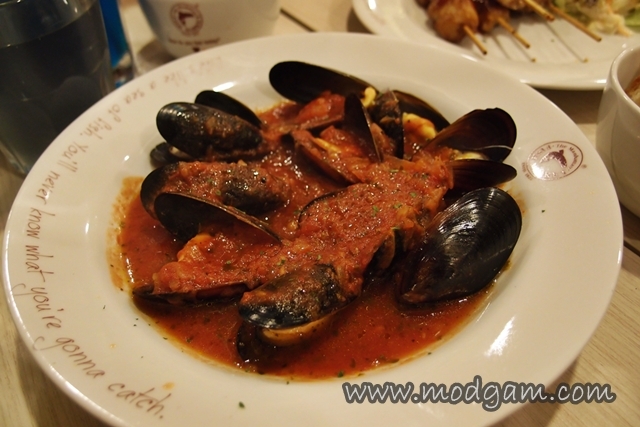 Stewed Tomato Mussels S$7.95 – A serving of stewed mussels in a rich tomato herb sauce with baguette for dipping. 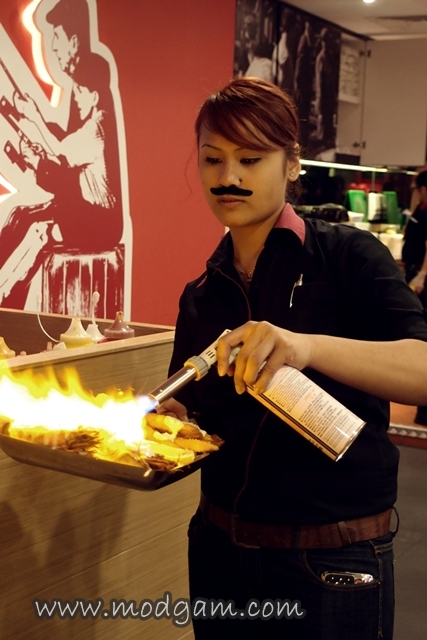 Chipotle Fish Skewers S$6.95 – Grilled fish skewers served in a rich coat of smoky Chipotle sauce on a bed of Coleslaw. 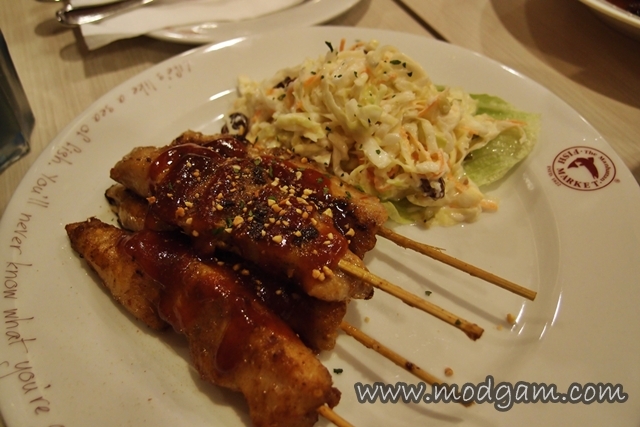 I really love the Chipotle sauce and its rather refreshing to be eating grilled fish on a stick. 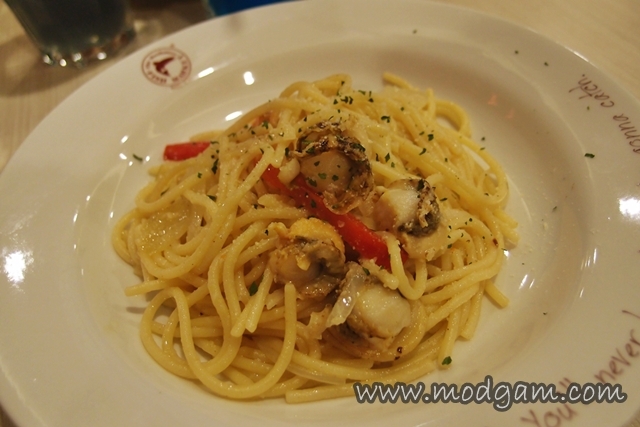 Scallop Americana S$9.95/Lite, S$13.95/Regular – sweet and juice scallops sauteed with capsicums with a hint of black pepper make this a wonderful pasta to savour. 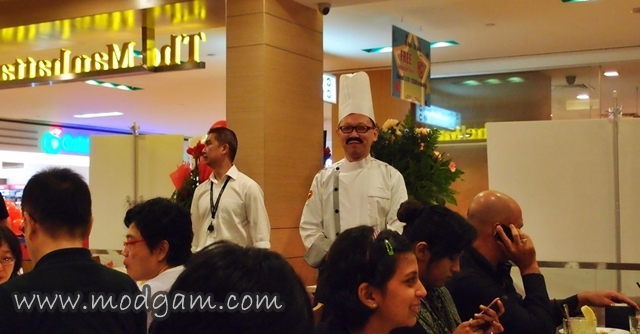 The very friendly and fun loving staff who helped make our food tasting a lot more fun. 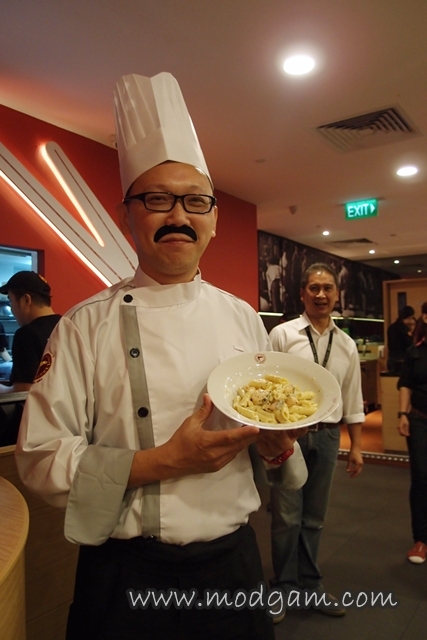 The fun loving chef who is all cute and friendly. He was explaining to us the dishes served and how they came up with the recipe. Made new friends, Zerika and CK. Me with Jeremy. 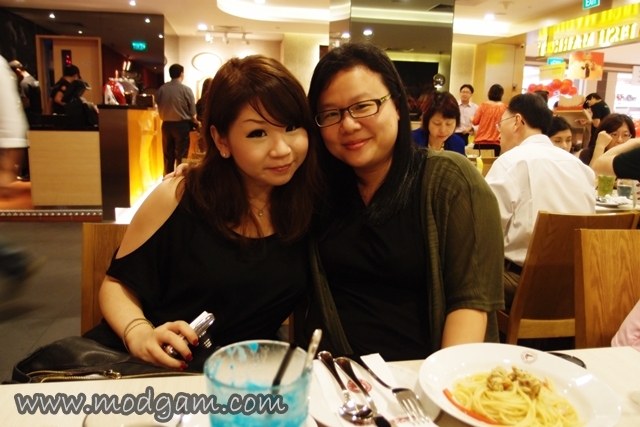 =] Great company with yummy food = blissful! 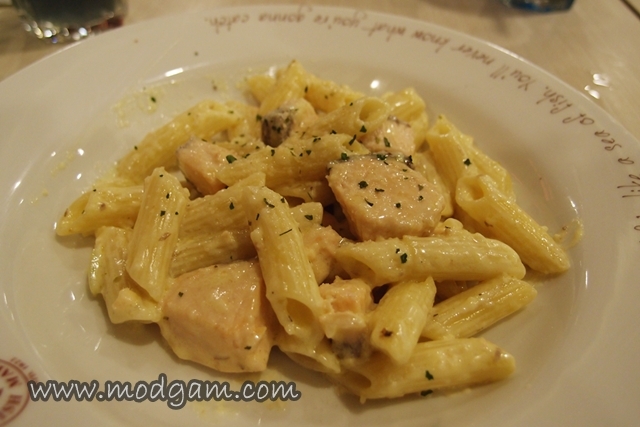 Creamy Salmon Penne S$11.95/Lite, S$15.95/Regular – A heavenly marriage of creamy sauce and salmon chunks makes this simply satisfying. 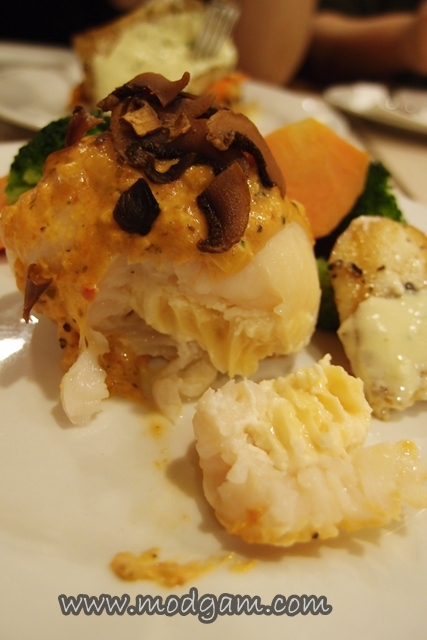 Spicy Baked Fish S$15.95 – Warning, this is not for the faint-hearted! 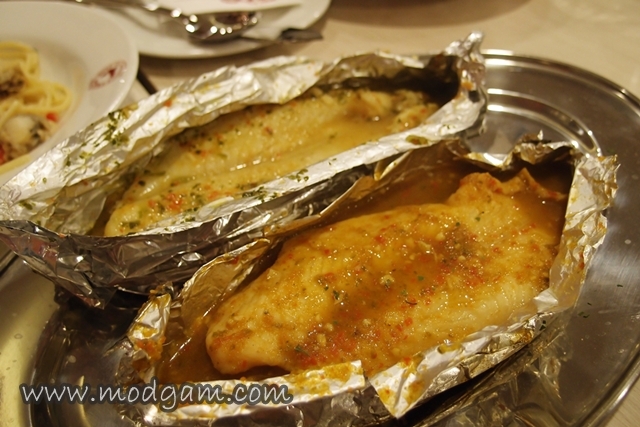 Savour a baked Dory fillet in extra spicy marination, complemented with Garlic Herb rice and vegetables. Guranteed to jumpstart your senses! This is yummy according to my spicy loving friends, a tad too spicy for the non-chilli eating me. 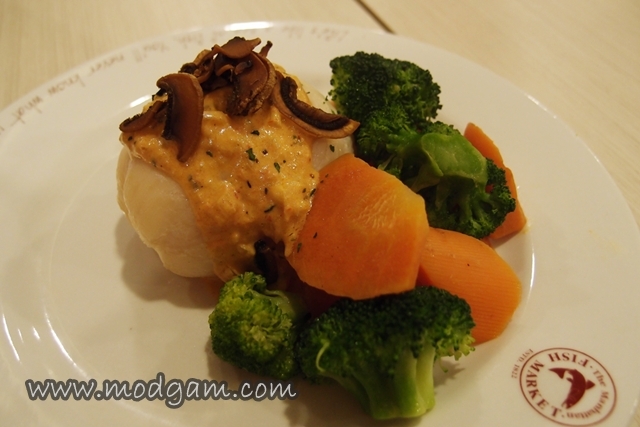 Poached Cheesy Dory S$15.95 – Enjoy creamy cheese oozing from poached dory fillet, drizzled with spicy cream sauce, accompanied by wholesome brocoli and carrots. This is my favorite dish! So very yummy and the oozing cheese excites me for I am a huge fan of cheese. 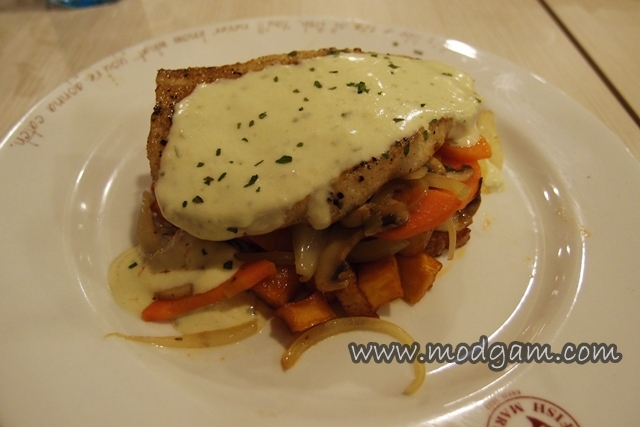 Grilled Salmon Fillet S$17.95 – Grilled flaky salmon fillet complemented with garlic herb sauce and served on a mixture of smokey sweet potatoes, potatoes and sauteed vegetables. 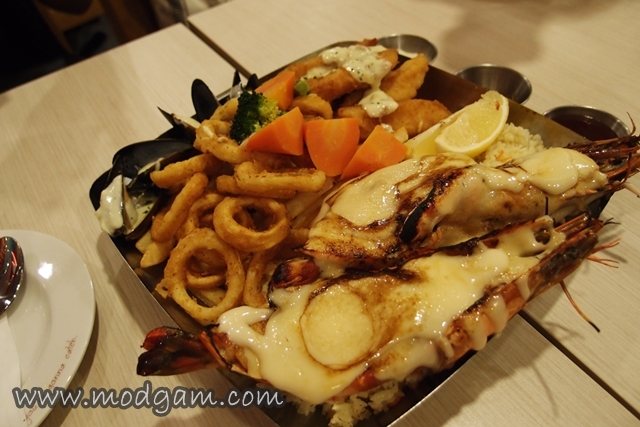 Flaming King Prawn Platter S$23.95 – Treat yourself to the luxurious king prawn, flamed to give it that delicious caramelized flavour, served with garlic herb rice and vegetables. Awesome dish to share around. Cookie Sundae S$3.50 – Sweet serendipity brought on by crushed oreo cookies in cool, creamy ice-cream. Fruit Sundae S$2.90 – A tropical sundae treat consisting of mandarin orange, jackfruit and mango will simply certainly refresh your palate. 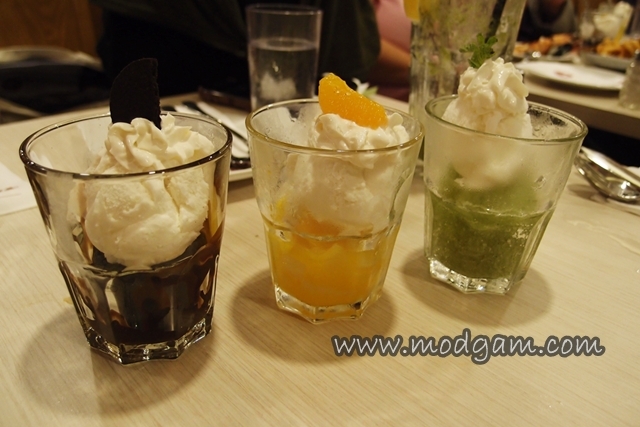 Citrus Sundae S$2.90 – Our very own citrus mint, now given a frozen confectionary twist for a deliciously refreshing dessert. 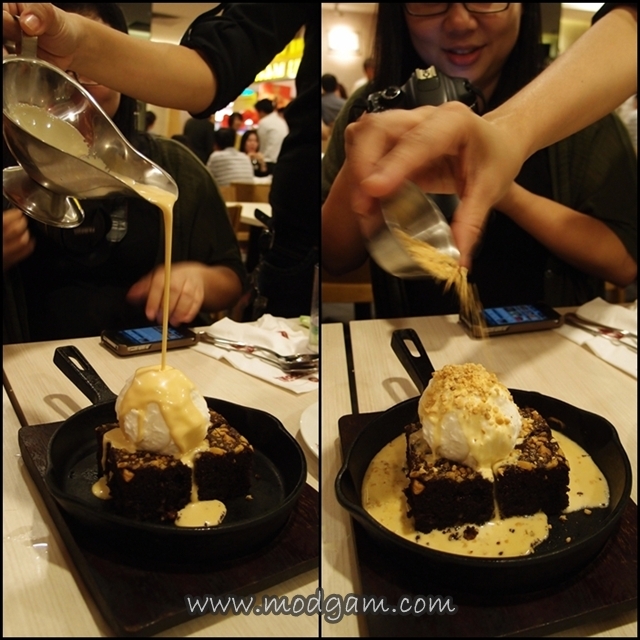 Sizzling Brownie with Ice-cream S$9.90 – The harmony of elements, enjoy a warm sizzling brownie, topped with smooth vanilla ice-cream in sweet caramel sauce and nuts. 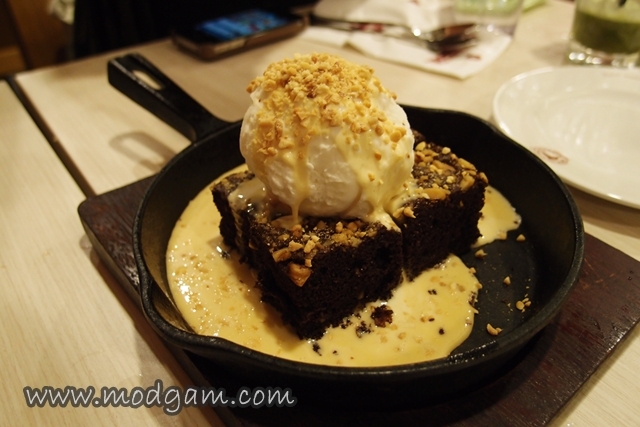 This is soooo yummy and have 2 of my best love in 1; chocolate and caramel! Be sure to head to The Manhattan Fish Market near you and try the new menu!! 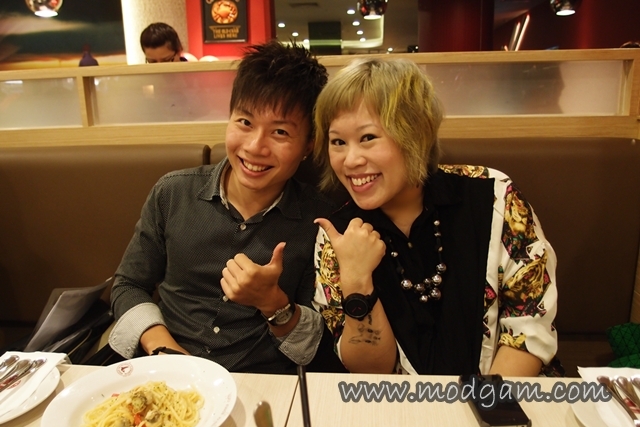 Birthday boys and girls will receive 10% off their total bill. If you reserve your table in advance, you will also receive a complimentary Manhattan Drink Tower, a special drink concoction, with a minimum spend of S$50 for 6 pax and above! 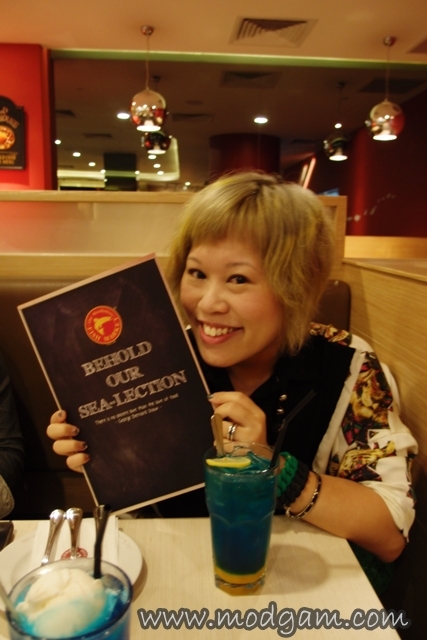 Celebrate your next birthday at The Manhattan Fish Market! !